Rovio wants to be the next Pixar. 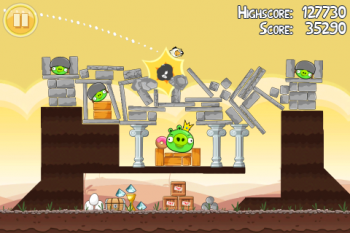 An otherwise inexplicable Angry Birds feature film is the first step in that plan. Actually, that upcoming Angry Birds movie is step two in the plan. Step one would be hiring David Maisel to advise the casual games publisher on its burgeoning Hollywood stardom. If you don't spend your brunch hours reading the trades, you may not recognize Maisel's name, but if you've been to a theater anytime in the last decade you've likely seen the impact he's had on the movie making biz. David Maisel was the key figure in the creation of Marvel Studios, the production company responsible for almost all of the awesome superhero flicks of the recent past. Rovio execs hope Maisel can create the same sort of business model for them, and turn the gaming firm into "another Pixar." To that end, Rovio has been busy scooping up animation talent. The firm bought Finnish animation studio Kombo last month, and immediately tasked the animators with creating animated vignettes based on the Angry Birds universe. "We're building a media company and have always been interested in moving further into the entertainment space, but we are taking it one step at a time so that we can use our strength to build an important entertainment presence from outside of the major studios," Rovio CEO Mikael Hed told Variety. You have to respect the ambition, but does anyone else think Rovio is punching well above their weight class here? In sum, the company has had one hit game to date, has never offered any evidence that it knows how to craft a coherent story in any medium, and utterly lacks experience with any aspect of film making. Yet Rovio hopes to rival Pixar. Honestly, this is just so ballsy that it broke any kind of cynicism I might have had. I hope this Angry Birds movie wins the Academy Award for best picture and makes scads of cash. I wanna see world leaders meeting with men in foam bird costumes to discuss policy ideas. I wanna see jackbooted, Rovio-branded paramilitary corporations quelling riots in Mogadishu. It's Rovio's world, you just live here.